The assessor’s wall chart tells the story of the last 20 years. Here’s a graphic it pays to keep in mind as the legislature in Salem considers various schemes to let property taxes rise faster than they have in recent years. 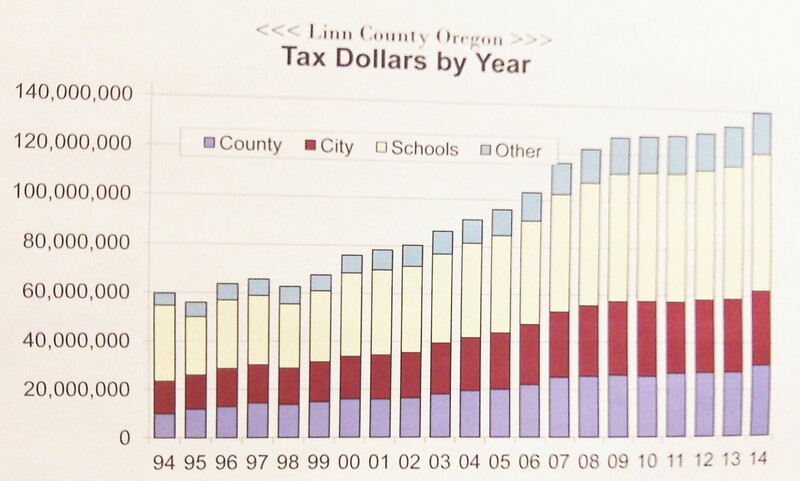 The chart is posted on the wall of the Linn County Department of Assessment and Taxation. 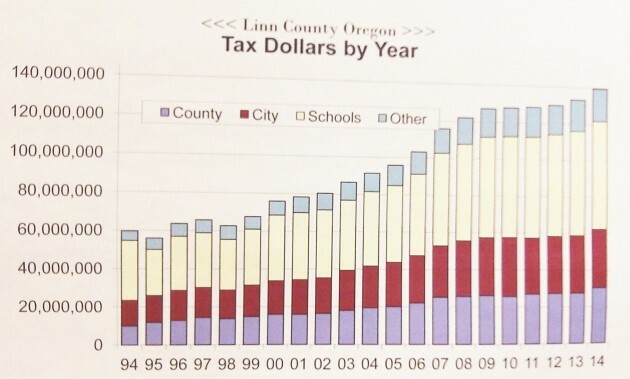 And as you can see, it tracks the almost uninterrupted growth in total property taxes imposed in the county, by all taxing districts together, since the 1990s. The chart is instructive because we hear plenty of complaints from taxing districts. They complain mostly about compression, the revenue-reducing effect of the caps on aggregate tax rates imposed by the voters in 1990, in the form of Measure 5. In Salem now, there is no shortage of proposals to loosen those restrictions. Just yesterday, more ideas along that line were filed. 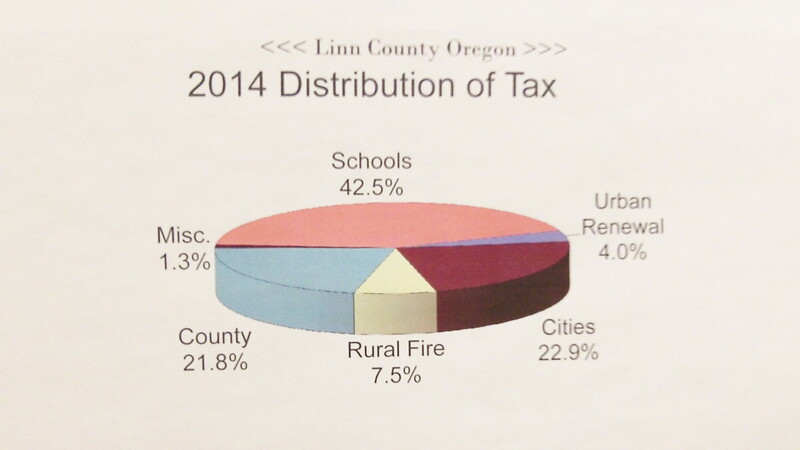 One would allow school districts to levy a local option tax of $2 per thousand dollars of assessed value, and this levy would be outside the cap on education taxes. This would avoid so-called compression of tax rates in order to fit under the cap of $5 per thousand for education. Another proposal sounds as though it would exempt all local option levies from compression, meaning they would be unlimited in their effect of pushing tax rates up. Changes like this would require amending the state constitution, so they would need the voters’ approval statewide. And local option levies themselves need the OK of local voters. But with a competent campaign, it’s not hard to persuade voters to approve incremental tax hikes, especially since you don’t have to pay the property tax in order to vote on raising it. Another graph on the wall: Where the taxes went last year. You just don’t get it, Hasso. These proposals are not about raising our property taxes. I believe everything the League says. Our Mayor, City Manager, and City Council are their loudest cheerleaders. And I’m a strong believer in freedom, so I’ll be voting…ye…y….sorry….I had a sudden choking spasm. I’ll get back to you after it passes…. The vast majority of government expenditures are for personnel. I look forward to Craig’s proposed “hit list” of services we can do without, and who he wants to add to the unemployment line. Let’s see . . . Teachers? Policemen? Firemen? or just get rid of the Tax Collectors and Public Works people? Or cut everyone’s pay in half, so they have less to pay the onerous taxes with? I look around, and see what I get for a couple thousand dollars: police, fire, water, sewer, education for the kids who will choose and work in my future nursing home, paved streets, street lights, parks, cultural stuff, GIS maps of just about anything. And a handful of engineers and bureaucrats to keep an eye on developments that might harm the livability of my neighborhood/town/county. What a deal! But it’s not a ‘couple thousand’ dollars. I have a 2 story, regular house in downtown Albany on a small lot. I’m at $3600 dollars and rising steadily. I expect it will hit $5000 in the next decade ($400+/month) to pay taxes on a home I now own, but effectively ‘rent’ from the state. The artificial bump in 2007-2009 really bumped up the tax dollars (artificially). I track it all with a spread sheet, which I could post if there is interest. One year my taxes increased 12% in that time frame. They did fall a bit in the correction, but not enough to make up for that increase. Last year they were on the rise again. In any case, as I head into retirement in the next 5 years, I am concerned about my ever-rising taxes on an income that will be effectively flat. Which brings up the unfairness of the property tax compared to either sales or income taxes. The latter two are based on one’s ability to pay, since they are based on income (sales is effectively spent on income – savings). The property tax bears no relation to one’s ability to pay. If a man loses his job, becomes sick and cannot earn money, retires (or is forced into early retirement), the property tax continues to rise, and can end up taking away the man’s home. I have watched my grandparents, and now my mom (who is 72) being every more heavily taxed in retirement, to the point that property taxes are a very real burden. Both of whom bought and paid taxes on their houses for 40 years before retirement. I would like to see Oregon lead the way in modifying the property tax to be based on either 1) the assessed taxes or 2) some percent (say 5%, but the exact amount is negotiable) of gross income (before deductions), whichever is less. Thus, if a man and wife’s gross taxable income is $50,000, their property tax would be capped at $2500. If they earn $100,000 it would be capped at $5000. If they are laid off work, lose a job due to illness, or retire (for whatever reason) and their gross income drops, then the cap would also drop. The percentage should be high enough (so perhaps 7% or something) so that it is not reached for most folks who are working and own a house. So in my case, with assessed taxes of $3600, I’d be fine with a percent that puts my cap at $5000 or $6000. But when I retire, and my income drops in half (with a huge portion of that going to health care then), it would fair, and allow for better retirement planning, and not force grandma to live on ramen noodles, to have property tax capped at some percent of income. “…less unfair.” is the operative term. Regardless of folks decrying its “regressive” nature, as long as it is is offset by a $-for-$ reduction in property and./or income tax, I am still 100% in favor of a sales tax. Regarding the annual rise of property taxes. Funny, I’ve never heard anyone crying about the rise in the value of their homes — that have been a ready bank account for many over the years. I guess we do not hang out together, or you would have heard me complaining about it. Especially in the artificial housing value increase a while back. As I was taught by my father and father-in-law to never, ever borrow against your house, I have no desire, and experience no benefit from a rising house value. Our family have always bought one house to live and die in. Also, as I want my kids to be able to afford a house someday, I prefer just the opposite, lower house prices. I recall before my father-in-law died, back in 2000, God rest his soul, that he jokingly said he should just get some junker cars and overturn them on the front of his property out on Oakville road, to depreciate his house value. It was a joke, but the fact is that the rising value of his land was of no benefit at all to a man who wishes to live within his means and be beyond the reach of the bank. I would happily trade a sales tax for a property tax, but would not go for a simple reduction in property taxes, as I expect it would slowly creep back up. Unless there were some real cap put on the property tax that was linked to income (one’s ability to pay). I also 100% agree that until/if/when there would be a constitutional “cap” along the lines of what you say, we will never see a sales tax in Oregon — regardless of my feelings about it.